The Standing Rock uprising is expanding minds and opening hearts, and teaching thousands about ways of life that put the sacredness of life first. At the Oceti Sakowin camp there were celebrations into the night when the U.S. Army Corps of Engineers’ decision was announced. Fireworks lit up the sky, which is normally dominated by police searchlights, and there were songs, prayers, and dance. And tears. The decision to halt work on the Dakota Access pipeline may be the victory that the Standing Rock Sioux tribe and thousands of water protectors were looking for. On the heels of the announcement, Energy Transfer Partners issued a statement insisting that they will go ahead with the project. What that means is not yet clear, but whatever happens the events at Standing Rock have been transformative, and these victories are not ones that Energy Transfer Partners or even President-elect Trump can take away. Here are just a few things that have shifted in our world because of the extraordinary Native-led uprising at Standing Rock. It was a scene I didn’t think I’d ever witness. Veterans at Standing Rock, led by Wesley Clark Jr., spoke of the many ways the U.S. military had brutalized Native people, through killings, through taking their lands and even their children. And then they knelt down and apologized in front of the elders. These nonviolent warriors, sworn to uphold the Constitution, came to North Dakota to protect the water protectors, but they did something even more important by acknowledging historic harms and showing remorse. Clergy too came with humility and apologies. At a gathering in early November, one Christian denomination after the next burned the Doctrine of Discovery, a centuries-old religious doctrine that made its way into law and condones taking the lands of non-Christians. If it is possible to heal from the long U.S. history of genocide, these moves by clergy and veterans were powerful steps in that direction. The work of decolonizing is much bigger though, and it is Native-led. Within the camps, Lakota culture is at the foundation of everything, from the early morning prayers at the sacred fire to the food line, where elders are served first. Newcomers are reminded to respect these ways. Native people have led this movement from the beginning, and they are reclaiming their power. This time, non-Natives in large numbers stood with them and learned from them ways to live that are inclusive and collective. And as people return home from the camp, the effects will ripple out into communities across North America for years to come. Walk to the edge of the Cannonball River at Standing Rock, or to the banks of the Missouri River, which provides water to the Standing Rock Sioux tribe and Cheyenne River tribes, and to millions of others farther downstream. And then consider what it would mean if DAPL ruptured, spewing toxins into this precious shared water. The core idea that “water is life” is self-evident, as our bodies are nearly two-thirds water. Yet the implications are radical. What would it mean to actually protect water and, therefore, to also protect our health? Even more radical is the idea that we would sacrifice the comforts of fossil fuel-based consumerism for the quality of that water, giving a gift of well-being to our children and future generations. Water is important everywhere, but the Sioux people, by protecting the water of their place on Earth, have shown what moral authority looks like. Their commitment attracted support from around the world, and showed people everywhere what it means to protect your home. The American people want to switch to renewable energy—not invest more in fossil fuel infrastructure. Many are closing accounts with big banks and moving their funds into credit unions and community banks, thus helping to rebuild the economy to support communities and life. And at Standing Rock, people found many ways to exert power. In the face of pepper spray, rubber bullets, dogs, concussion grenades, and water cannons, the water protectors remained nonviolent. They were arrested by the hundreds, strip-searched, and placed in fenced enclosures resembling dog kennels. But their responses were prayerful and sometimes even loving. This display of courage moved the hearts of millions. As law enforcement escalated the violence, water protectors increased their presence. And because of independent reporting and social media, the story got out in real time even when other media weren’t paying attention. Amy Goodman’s Democracy Now coverage of dogs attacking water protectors was the first reporting to alert the world to the brutality of pipeline security. The beautiful short films featuring the people at the camp, the posters and art, the water protectors’ drones, the tweets and live feeds from Standing Rock—all have kept the story alive for months. People power in all these forms works. Thousands came to the remote plains of North Dakota. Hundreds of thousands took action through donations and demonstrations. The sense of power and hope that goes with this decentralized movement, and the accumulating know-how, will make the next action easier to pull off, and the next one after that. The work, prayers, hardship, and collaborations are not over. There may be new rounds at Standing Rock, and more water protectors may be injured and traumatized there or at other locations. There may even be loss of life. And there are other pipelines that need to be confronted by water protectors. Just last week, Canadian Prime Minister Justin Trudeau gave the green light to the Kinder Morgan pipeline, and the presidency of Donald Trump could threaten everything we hold dear. Nonetheless, this is a time to celebrate. The water protectors won a huge victory with the Corps of Engineers decision—a victory that benefits not only the Sioux tribes, not only those along the Missouri River, but everyone. We all drink water and need a stable climate. As we navigate what may be the most dangerous time in human history, the lessons from Standing Rock can guide us. As we create a post-fossil fuel society, we can take the lessons of respect and nonviolence, of valuing life over money, of learning from the indigenous peoples as cornerstones. A revolution in values and culture is rippling out across the country and the world, and it started at Standing Rock. Sarah van Gelder is co-founder and editor at large of YES! Magazine, and author of The Revolution Where You Live: Stories from a 12,000-Mile Journey Through A New America. 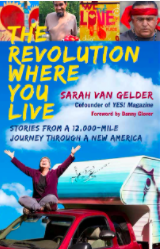 The Revolution Where You Live — Order It Now at 20% off! Read Sarah’s Column at YES!